The Green Truck Philosophy: The Green Truck is built on its 3 core values: • Safe, Eco-Friendly Move • 100% Customer Satisfaction • Giving back to our Community The answer to our slogan “Why Not Move Green” is found within these core values. Safe Eco-Friendly Move The Green Truck understands that the moving industry is responsible for a considerable amount of waste distributed across our local environments each day. It is for this reason that our company has implemented Eco-Friendly practices throughout our entire business model. The Green Truck provides an Eco-Friendly move by fueling our trucks with Bio-diesel, planting two trees after every move, recycling all of our customers moving materials, as well as offering reusable moving containers to our customers for rent. We want our customers to know that by choosing The Green Truck as their preferred mover they have also contributed to cleaner communities across their local area. 100% Customer Satisfaction The Green Truck realizes that there is a negative image surrounding the Moving industry as a whole. We are committed to changing this view by providing them extraordinary customer service as well as moving services. Our offices provide customers with a 3 step communication process during move day that assures them a successful move. We want to make sure our customers are satisfied at all times. In order to protect our customers belongings we use all biodegradable materials such as furniture blankets, packing materials, and equipment. These eco-friendly materials are just as trustworthy and far more beneficial to the environment then traditional materials. Once a customer is finished unpacking their belongings they can call and schedule a time for pickup of their cardboard boxes and recyclable materials used during their move. 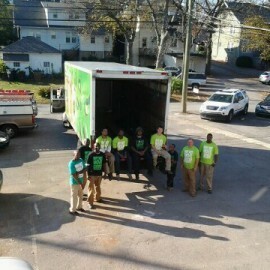 Giving Back to our Community The Green Truck is committed to building stronger communities through eco-friendly efforts as well as public service. Since opening in April 2010 The Green Truck has planted over 5000 trees locally and in third world countries. We have accomplished this through our partnerships with Trees for the Future and The Tennessee Environmental Council. Each month The Green Truck visits at least one elementary school within the Metropolitan area to do a local tree planting ceremony. During this event we educate elementary kids grade 1st – 4th about the benefits of planting trees and living eco-friendly lifestyles.